The Philadelphia Flyers are currently on a nine-game winning streak during the club’s milestone 50th anniversary season. This is the franchise’s longest winning streak since 1995. On the team’s current run, there has been a different hero every night. The games have been extremely competitive, and in true Philly fashion the team has found a way to win, no matter what. Last week, goaltender Steve Mason was named the NHL’s First Star of the week. Mason won four games, posting unbelievable numbers, including a 1.71 goals-against average and a .945 save percentage. In total, Mason is responsible for seven of the team’s nine wins during the current streak. He is playing some of the most consistent hockey of his career, and the team has provided him with goal support when needed. His play has been especially significant considering he only had five wins on the season prior to the streak. It was actually rookie goaltender Anthony Stolarz who got the streak started when he defeated the Calgary Flames in his first career NHL start. Stolarz was called up to the big club after Michal Neuvirth went down with a knee injury in mid-November. Stolarz made his second start Sunday and posted his first career shutout as the Flyers defeated the Red Wings in overtime by a final score of 1-0. No big deal, right? 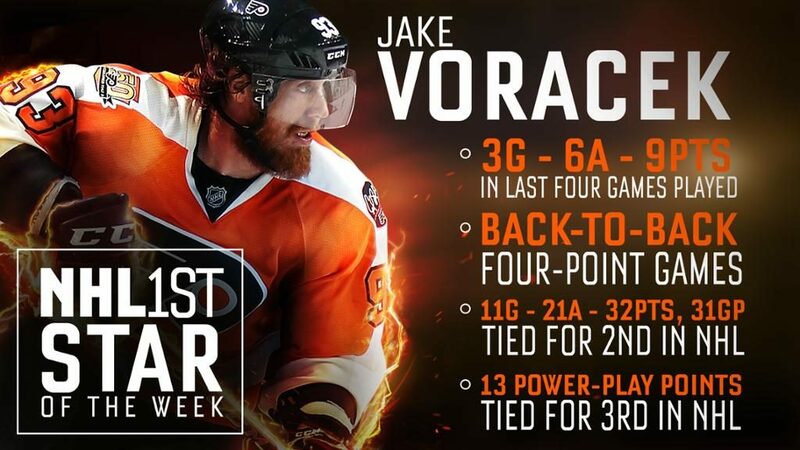 This week, another Philadelphia Flyer has captured the top spot: Jakub Voracek. Voracek led the NHL with six assists and nine points in four outings. He helped the Flyers (18-10-3, 39 points) complete a perfect week and extend the winning streak to nine games, the team’s longest such run since April 2-22, 1995. Voracek became the first Philadelphia Flyer to record consecutive four-point games since Hall of Famer Eric Lindros did it back in 1998. Voracek is making a solid case for comeback player of the year in my books. Last season, his production dipped to 55 points after enjoying a career year in 2014 with 81 points. Voracek’s name is back among the NHL leaders in points this season, as he currently sits second overall with 32 (tied with Vladimir Tarasenko, each trailing Connor McDavid by seven points). His 11 goals through 31 games matches his total from a season ago. 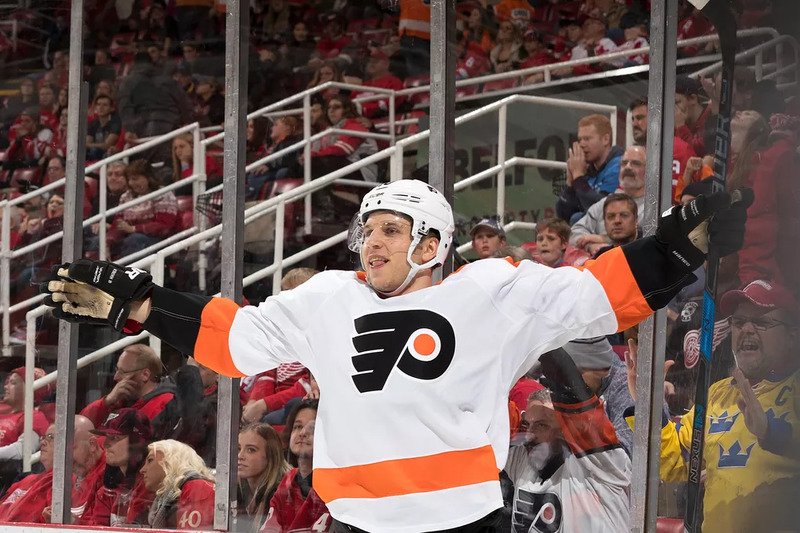 Brayden Schenn has been ‘The Man’ for the Flyers in the past two games. He had three power-play goals in a 4-2 win over Dallas on Saturday and then scored 2:44 into overtime against Detroit on Sunday. Not a bad weekend. And who knows, maybe next week we will see Schenn’s name on the NHL Stars of the Week list. 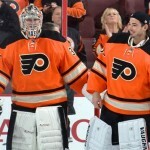 The Philadelphia Flyers’ defense has played perhaps the biggest role all season in the club’s success. By committee, the defense corps leads the league in total points with 83. To the surprise of many, 19-year-old defenseman Ivan Provorov leads the team in average ice time (20:38); that number is only going to increase with the news of recent injuries to Shayne Gostisbeherez and veteran Mark Streit, who both lead the blue line with 16 points through 31 games. We knew Provorov was going to be a special talent. However, the amount he has learned in a short time-span is impressive for anybody, let alone a teenager. 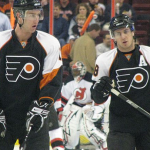 Two names not mentioned who have played key roles in the team’s recent play are Claude Giroux and Wayne Simmonds. They have a combined 20 points during the streak and are key cogs in the team’s power-play, the second best man-advantage unit in the league at a completion rate of 24.1 percent, trailing only the Columbus Blue Jackets (24.6 percent). Simmonds is tied for fourth in the NHL in goals with 15 and has the most power-play goals in the NHL with 8. Giroux and Simmonds rank first and second in the league in power-play scoring with 15 and 14 points, respectively. Interestingly, Voracek and Schenn are tied for third place (along with Tyler Seguin) with 13. The Philadelphia Flyers will attempt to extend their winning streak to ten games Wednesday night when they take on the Colorado Avalanche. Everyone knows these types of streaks don’t last forever, but the Flyers are certainly making the most of it.